Today is a big day in terms of fundamental news. News started 1 hour before the New York session USD building permit. Also lined up with RBA , BOE, BOC bank governors speaking in public which tends to move the currency market a lot. 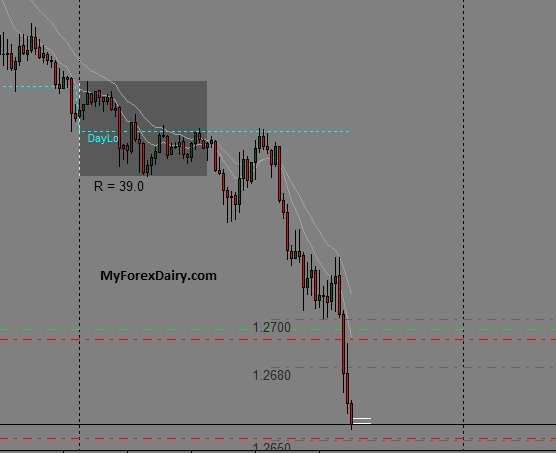 At the time of writing this blog, i honestly did not see big movement although it was enough to bank some pips. I was wary of the news hence i didn’t take lot of good positions. Some other days it could have saved me from going loss but today i’m ending my session with a small profit. But i do learn almost everyday. It was USD News but i took a pending pullback on CADJPY which was a mistake. That early hour only USD should move due to news but not sure what i was thinking. Nevertheless i could punch out quickly from that trade. I Banked 30 pips on this pair. Took a ‘Break of Low’ as you can see from the above picture which gave me some good moves. However, i took some losses on others pairs so not much of pips hunt today. There was good moves on YEN pairs early NY session but i spooked out and did not take positions. It is now 1.5 hours after NY open and i was really expecting spiky moves due to bank governor public speech but so far that didn’t happen.